2. A Entropy is positive during reaction 2, as creating gas molecules out of liquid molecules demonstrates an increase in disorder. Using ΔG = ΔH − TΔS, if the temperature increases, the TΔS term will also increase. As the overall value for that term is negative, increasing TΔS makes ΔGmore negative. 3. C Use the ∆G = ∆H − T∆S equation. To do that, determine the signs of both ∆H and the T∆S term. We know that ∆H is negative. ∆S is negative as well, because the reaction is going from four molecules to two molecules, meaning it is becoming more ordered. That, in turn, means the T∆S term is positive. Reactions are only favored when ∆G is negative. As temperature increases, the T∆S term becomes larger and more likely to be greater in magnitude than the ∆H term. If the temperature remains low, the T∆S value is much more likely to be smaller in magnitude than the ∆H value, meaning ∆G is more likely to be negative and the reaction will be favored. 4. 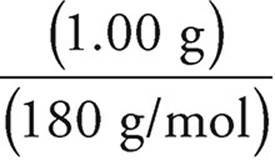 D The molar mass of CH4O is 32 g/mol, so 64 g of it represent two moles. For every one mole of CH4O that decomposes, 65 kJ of energy is released—this is indicated by the negative sign on the H value. If two moles decomposes, twice that amount—130 kJ—will be released. 5. D All four reactions have a negative value for enthalpy. Energy is absorbed (positive ΔH) when bonds break and released (negative ΔH) when bonds form, so in order for the overall ΔH value to be negative, more energy must be released than is absorbed during each reaction. 6. A Remember that ∆G = ∆H − T∆S. If the reaction is thermodynamically favored only when the temperature is very low, then ∆G is negative only when T is very small. This can happen only when ∆H is negative and ∆S is negative. A very small value for T will eliminate the influence of ∆S. 7. C In an exothermic reaction, energy is given off as the products are created because the products have less potential energy than the reactants. 8. D A catalyst lowers the activation energy of a reaction and makes it proceed faster. However, it has no effect on the amount of bond energy in either the reactants or products. 9. D The equations given above the question give the heats of formation of all the reactants and products (remember: the heat of formation of O2, an element in its most stable form, is zero). ∆H° for a reaction = (∆H° for the products) − (∆H° for the reactants). From CH4, we get x. The heat of formation of O2 is defined to be zero, so that’s it for the reactants. ∆H° for the reaction = (2z + y) − (x) = 2z + y − x. 10. A A solid is changing to a gas, that means the products are less ordered than the reactants. Increasing disorder is represented by a positive value for ∆S. 11. B The bond energy is the energy that must be put into a bond to break it. First let’s figure out how much energy must be put into the reactants to break their bonds. To break 1 mole of O=O bonds, it takes 500 kJ. So to break up the reactants, it takes +1,500 kJ. Energy is given off when a bond is formed; that’s the negative of the bond energy. Now let’s see how much energy is given off when 2 moles of H2O are formed. 2 moles of H2O molecules contain 4 moles of O–H bonds, so (4)(−500) kJ = −2,000 kJ are given off. (−2,000 kJ, the energy given off) + (1,500 kJ, the energy put in) = −500 kJ. 12. B During a phase change, the products and reactants are at equilibrium with each other, meaning ΔG is zero. When a liquid turns into a solid, disorder decreases (negative ΔS) and energy is absorbed (positive ΔH). (D) is incorrect because 298 K = 25°C, and water does not freeze at that temperature at 1.0 atm. 13. C Point 3 represents the activated complex, which is the point of highest energy. 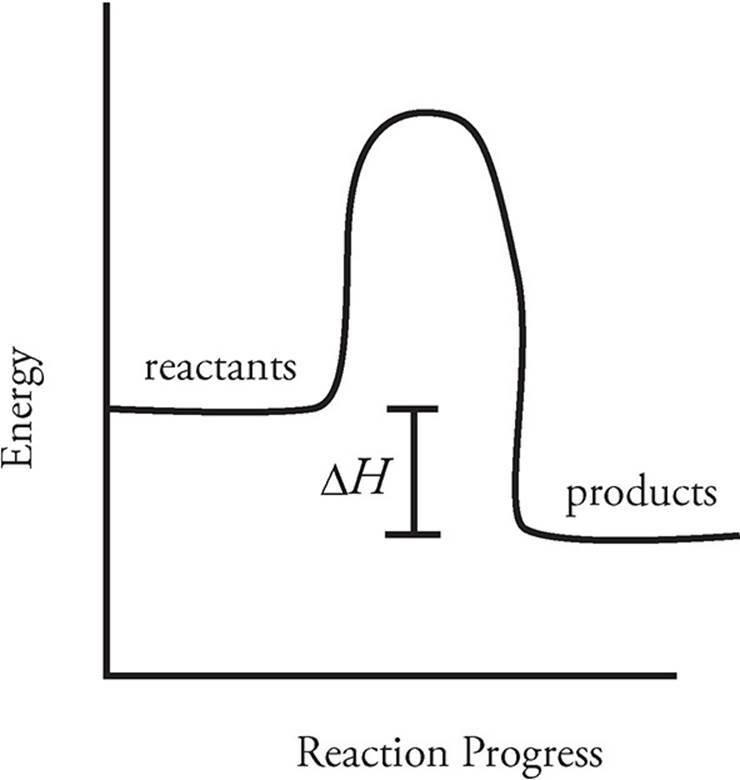 This point is the transition state between the reactants and the products. 14. A The equations given on top give the heats of formation of all the reactants and products (remember: the heat of formation of O2, an element in its most stable form, is zero). From C2H2, we get +230 kJ. The heat of formation of O2 is defined as zero, so that’s it for the reactants. ∆H° for the reaction = (−1,070 kJ) − (+230 kJ) = −1,300 kJ. 15. D Choice (D) is the only reaction where the number of moles of gas is increasing, going from 2 moles of gas on the reactant side to 3 moles of gas on the product side. In all the other choices, the number of moles of gas either decreases or remains constant. 16. B For the reaction to occur without the input of additional energy, it must be thermally favored, meaning ∆G < 0. The product is a solid, which is more ordered than the gas which is part of the reactants, meaning ∆S < 0. Via ∆G = ∆H − T∆S, if ∆S is negative, the T∆S term is positive. Thus, for ∆G to be negative as it is in this reaction, the value for ∆H must be negative as well. 17. B The reaction that forms 2 moles of HF(g) from its constituent elements has an enthalpy change of −540 kJ. The heat of formation is given by the reaction that forms 1 mole from these elements, so you can just divide −540 kJ by 2 to get −270 kJ. 18. C The reaction occurs without additional energy being added at room temperature, therefore it is favored, meaning ∆G is negative. A liquid is more disordered than a solid, meaning ∆S is positive. Finally, heat is absorbed by the ice as it melts, meaning ∆H is also positive. 19. A You can use Hess’s law. Add the two reactions together, and cancel things that appear on both sides. Now we can cut everything in half to get the equation we want. 1. (a) Use the entropy values in the table. (b) Use the equation below. Remember that enthalpy values are given in kJ and entropy values are given in J. The reaction is exothermic; therefore the reactants must have more energy than the products, as indicated. The difference in energy is equal to the ΔH for this reaction. (d) The enthalpy change of the reaction, H°, is a measure of the energy given off by 1 mole of glucose. 2. (a) Use the relationship below. Remember that enthalpy values are given in kJ and entropy values are given in J. (d) S° is very small, which means that the entropy change for the process is very small. This makes sense because the number of moles remains constant, the number of moles of gas remains constant, and the complexity of the molecules remains about the same. 3. (a) By definition, ΔH°f and ΔG°f for N2(g) and H2(g) are equal to zero. From (b), ΔS° is negative, so increasing the temperature increases the value of ΔG °, making the reaction less thermodynamically favored. 4. (a) ΔS° is negative because the products are less random than the reactants. That’s because gas is converted into liquid in the reaction. (b) The value of ΔS° would increase, becoming less negative because H2O(g) is more random than water but remaining negative because the entropy would still decrease from reactants to products. (c) G° is negative because the reaction is favored. (d) H° must be negative at 298 K. For a reaction to occur spontaneously from standard conditions, either ΔS° must be positive or ΔH° must be negative. This reaction is thermodynamically favored although ΔS° is negative, so ΔH° must be negative. 5. (a) ΔS° is negative because the products are less random than the reactants. That’s because two moles of reactants are converted to one mole of products and gas is converted into solid in the reaction. (b) ΔG° is negative because the reaction is favored. ΔG° will become less negative because as temperature is increased, the entropy change of a reaction becomes more important in determining its favorability. The entropy change for this reaction is negative, which discourages favorability, so increasing temperature will make the reaction less thermodynamically favored, thus making ΔG° less negative. (d) The concentration of CO2 will decrease as the reaction proceeds in the forward direction and the reactants are consumed. The temperature will increase as heat is given off by the exothermic reaction. (b) The heat gained by the water is the same as the heat lost by the aluminum. (e) Error 1: If some of the heat that was lost by the aluminum was not absorbed by the water, that would cause the calculated heat gained by the water in part (a) to be artificially low. This, in turn, would reduce the value of the specific heat of aluminum as calculated in part (b). Error 2: If there was more than 25.0 mL of water in the calorimeter, that would mean the mass in part (a) was artificially low, which would make the calculation for the heat gained by the water also artificially low. This, in turn, would reduce the value of the specific heat of aluminum calculated in part (b). There are many potential errors here, but as long as you can quantitatively follow them to the conclusion that the experimental value would be too low, any error (within reason) can be acceptable.